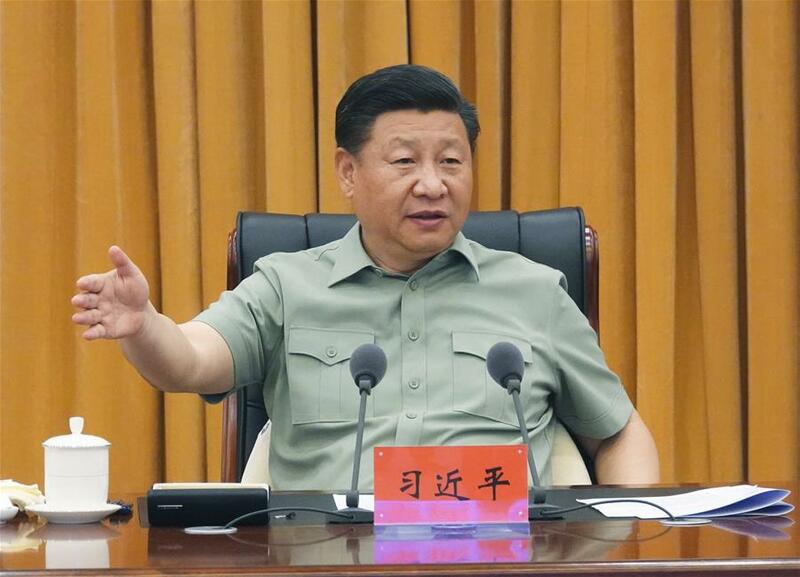 JINAN, June 15 (Xinhua) -- President Xi Jinping has stressed building an elite maritime force to resolutely accomplish various missions entrusted by the Party and the people. Xi, also general secretary of the Communist Party of China Central Committee and chairman of the Central Military Commission (CMC), made the call during an inspection to the navy under the Northern Theater Command of the Chinese People's Liberation Army on June 11. Xi emphasized the need to resolutely implement the Party's thinking on strengthening the military for the new era and continue to enhance the political loyalty of the armed forces, strengthen them through reform and technology, and run them in accordance with law. Xi also spoke of the need for the navy to meet the requirements of transformation. Xi visited a submarine force around 3:30 p.m. Monday as a summer breeze rustled through the trees on the coast of Qingdao, east China's Shandong Province. At port was a new-type submarine which had taken part in the recent naval parade in the South China Sea. On the hull, soldiers stood in formation waiting to be inspected. Xi went aboard and chatted with them, asking about their work and life. The president said he is always concerned about soldiers who spend years of their life on submarines deep under the sea. As he learned that the soldiers were dedicated to their career, worked hard, and had accomplished their tasks, Xi nodded his head in appreciation. The president then went down into the cabins to learn about the weapons and ammunition. He encouraged soldiers to remain firm in ideals and convictions, build a strong team, and train themselves to excel in skills. Xi signed his name on the logbook. Before leaving the dock, Xi walked toward another submarine nearby and waved to the soldiers. Xi inspected the training of the submarine force at a comprehensive simulation facility. "How is simulation-based training going? Can the facilities meet the demands? Are there any challenges?" the president asked. He was pleased to learn that the soldiers benefit a lot from the training and spoke of the need to continue to improve training infrastructure. Xi watched a group of trainees undergo a sonar recognition exercise. He joined to test them and gave a thumbs-up to a soldier who gave the correct answer. Xi met with senior navy officers at the navy headquarters of the Northern Theater Command and took a group photo with them. He listened to the command's naval work report and gave an important speech. Xi spoke of the need to grasp the changes of national security circumstances, speed up preparations for military struggle, including battle planning, capacity building and command system building. Xi said the intensity of training needs to be enhanced, its modules to be innovated, and its supervision to be strengthened. He stressed the need for targeted training, training for commanders, and training under combat conditions. He called for efforts to implement the requirements for the transformation of the navy, accelerate the work to improve elite combat forces, and focus on tackling areas of weakness and making breakthroughs. Forward-looking plans and top-level designs are also needed to promote the transformation and development of naval air forces, Xi said. Xi also stressed the absolute Party leadership over the armed forces and ceaseless work to improve Party conduct, enforce Party discipline and fight corruption. "Ideological work within the military should be strengthened and combat capability should be regarded as the criterion for military building," Xi said. He urged the navy to coordinate with civilian departments, innovate in institutions and mechanisms and development models to improve military-civilian integration. On Thursday morning in Jinan, capital of Shandong, Xi met with senior officers of troops stationed in the province. CMC Vice Chairman Xu Qiliang attended the events.